In a word – absolutely! In fact, nothing beats discounts cards in terms of profits, ease for your group or organization, fun, and outstanding results. Over the years, tens of thousands of non-profit groups have relied on these handy little value-packed card again and again for reaching their goals and monetary needs. School organizations and clubs, church groups, sports teams, even local PTA groups have relied on discount cards to provide for their financial needs, doing so in a way that is fast, easy, and requires less work and effort than other methods. Over the years, kids and teens get tired of the same old thing – selling candy bars, wrapping paper, jerky, and cookie dough. Some of these products are just a hassle, considering you have worries such as storage, melting, spoiling, and lugging around heavy boxes while trying to keep up with the money. Think about catalog fundraisers, where those in your organization go around and hand out catalogs, then have to wait for the customer to make up their mind. Once that’s all said and done, you send off the orders, wait for them to come in – and then hope and pray the orders are correct. If they are, your group then goes back around the community to distribute the orders. Lots of work – and really, how much fun is that? With discount cards, you have none of these worries. If your organization has tried a variety of fundraising products over the years, you already know the profit margins usually aren’t all that great. Most allow for about 50% or 60% profits, and considering the difficulty in selling, it may take months or even longer to raise the amount of money you need. Over the past five years, it’s no secret the economy has been in a slump. People simply haven’t had the financial resources to spend money on things most of us consider “frivolous,” such as candy bars and cookie dough. 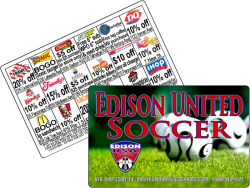 With discount cards, profits range from 50% to more than 100% depending on the size of your group and number of cards sold. Because they actually make it possible for customers to save money for an entire year on products and services they normally spend money on, you can meet your goals in far less time, without nearly as much work and effort. Smaller groups (those with about 25 who will sell) can expect 50% profits, but that’s nothing to sneeze at considering you earn $5 per card, and customers so readily buy. Larger groups, let’s say 100 who will sell, will enjoy 100% profit margins, which means sell 1,200 cards and your organization earns $10,000. Raising this amount of money would take forever with other fundraising methods, and you can just imagine the time, planning, and effort involved. People want to save money on those things they purchase on a regular basis, and with discount cards, they can. Your cards will have offers at a dozen or more merchants in the community listed on the back. These are discounts (15%, 20%, 25% off) and buy-one-get-one-free offers at fast food and fine dining restaurants, car care establishments, the local hair salon and/or gym, bowling or other family activities – whatever merchants you choose for your fundraiser. The customer gets to use the card at participating merchants for one full year, so you can imagine the savings. Now that you know more about how they work, are discount cards a good idea for fundraising?